Inspired by 2,000 years of storytelling yet rooted in the concerns of our present moment, this is a spectacular achievement--enchanting, both very funny and terrifying. It is narrated by our descendants 1000 years hence, looking back on "The War of the Worlds" that began with "the time of the strangenesses": a simple gardener begins to levitate; a baby is born with the unnerving ability to detect corruption in people; the ghosts of two long-dead philosophers begin arguing once more; and storms pummel New York so hard that a crack appears in the universe, letting in the destructive djinns of myth (as well as some graphic superheroes). Nothing less than the survival of our world is at stake. Only one, a djinn princess who centuries before had learned to love humankind, resolves to help us: in the face of dynastic intrigue, she raises an army composed of her semi-magical great-great--etc.--grandchildren--a motley crew of endearing characters who come together to save the world in a battle waged for 1,001 nights--or, to be precise, two years, eight months and twenty-eight nights. 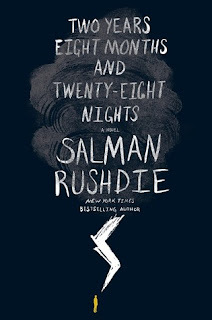 I'm not sure what I was expecting from this book, I have never picked up a Salman Rushdie story before, and yet I have heard so much about his amazing writing and this book truly appealed to me with the magical idea it gives readers in the synopsis. This book is inspired by years of storytelling, and is narrated by people over many years. I was truly interested in what was happening in this book, readers are taken on a journey of descendants of the djinn's over many years. The way Rushdie describes "The War of the Worlds" is truly intriguing, a strangeness begins when descendants of the djinn begin to show their powers and it opens up this other world. A battle begins for the survival of the world and these magical descendants are the ones who can save the world. I will admit that this is the type of book that takes a lot of focus, it's not one of those that you can do other things at the same time. I found myself needing to re-read sections at times because I was a little lost as to what was happening. It's a short story but you want to take your time with it so as to fully immerse yourself in the world that Rushdie brings to life. I thought the writing of this story is beautiful and really brings the magical aspects to life in such a way that you can imagine all this happening around you in this world. At times I did have difficulty because I felt like I was reading a history textbook, learning about the djinn and their past. And yet, despite these long historical passages, they did really add to the story and how everything came to be. This book combines mythology with current pop culture and it is a story for generations to come. Truly take a chance to experience this beautiful book, that shows readers in a time of chaos and war there is always a way to find beauty and love. I can see why Salman Rushdie is one of the greatest writers of our time, it felt like I was reading a fairy tale at times but a very real one, more for adults than children. I tried really hard to read this one but I just couldn't do it! I really enjoyed the magical aspects and focus on storytelling, but you're right about it feeling like a textbook. I wasn't able to finish it, and now I'm worried I gave up on it to soon. Maybe I'll try it again soon when I'm looking for more of a reading challenge.